Introduction: Sustainable hydrogen production via the catalytic steam reforming (SR) of acetic acid, that is one of the main constituents of the bio-oil, is attracting wide attention and much work is being devoted to the development of always more active catalysts. In the very first studies, noble metal-based catalysts were extensively employed but their cost has made Ni-based systems far more attractive, although the latter are more prone to coking and methane production. 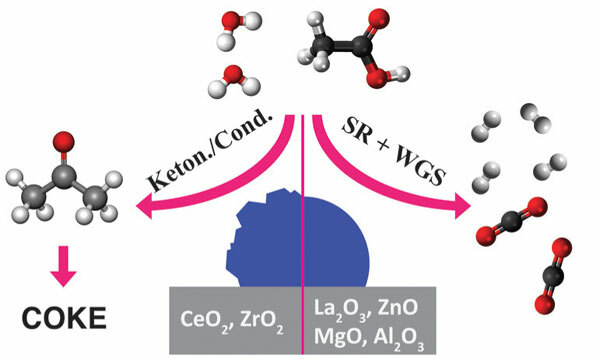 Importantly, recent theoretical works have shed light on the overall reaction network, unveiling the most crucial steps/intermediates involved in both the hydrogen generation and coke formation, which remains a major problem to overcome. Despite its importance, also reflected by the growing number of publications, there are few reports specifically dedicated to the acetic acid steam reforming, and comprehensive presentations of the reaction mechanism are still quite elusive. Conclusion: Hence, in this review, we present the latest catalysts developed on the catalytic steam reforming of acetic acid, along with detailed discussions on the strategies adopted to improve their performances, in particular as far as the active phase stabilization against sintering. The reaction mechanisms will be discussed as well, in hopes of providing helpful insight into the design of highly performing catalysts for sustainable hydrogen production from acetic acid and, possibly, from real bio-oil. Acetic acid, steam reforming, H2 production, coking, bio-oil, reaction mechanisms.